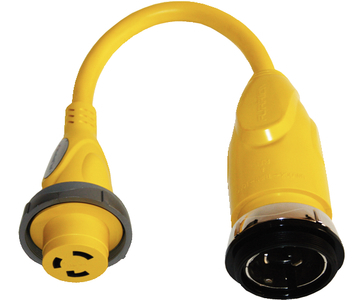 Pigtail adapters are used to convert plug sizes in wet environments. All plugs and connectors have side grips, are made to NEMA standards, and offer a universal fit with all other brands. 30 Amp connections also come with Powersmart LED power indicators. Bonus seal collar systems included with every connector except FP1530SY. Cables rated up to 600V, 105 degrees Celcius.